Have you ever wondered How to Make Hash Browns at home? The perfect hash brown potatoes are crispy on the outside and tender on the inside. But how do you achieve this perfect texture? Is there a secret? 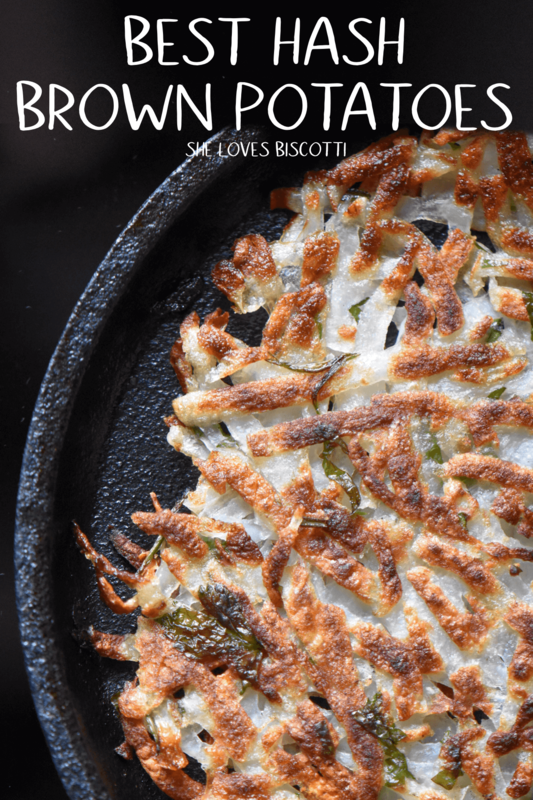 You won’t believe how simple and easy it is to make homemade hash browns! This post was originally published on April 11, 2015 and republished on January 5, 2018 with updated photos and content. Is there anything better than having a lazy weekend breakfast which includes light and crispy hash brown potatoes? 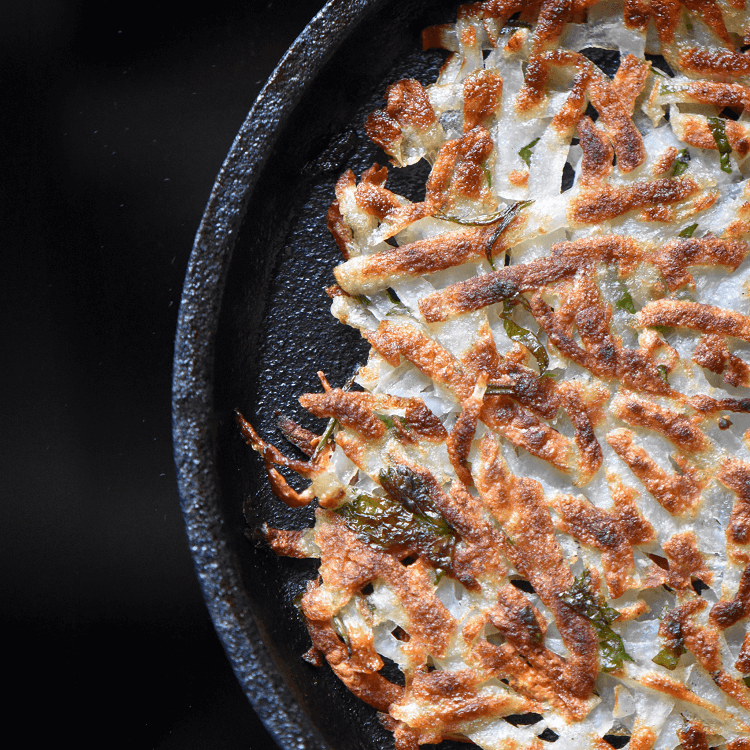 Not just any hash browns… I’m talking about the perfect hash brown potatoes. It really is so simple once you know some of the secrets. Are you ready? What do I need to make Hash Brown Potatoes? Potatoes. No surprise here. More details to follow. Olive oil. Any kind will do. Butter. Just a few pats are needed. Seasonings. Make sure to use your favorite herbs. Salt and Pepper. These will be added at the end. You need a box grater, a large bowl and a pan, preferably a cast iron pan. You also need a salad spinner, a potato ricer or some clean tea towels -more details to follow. What are the Best Potatoes for Hash Browns? Hash brown potatoes, also referred to as hash browns, are made with potatoes, and only potatoes. But did you know that there are literally thousands of potato varieties and each variety has different characteristics? Whether you are baking or cooking, you always need to make sure that you are using the right kind of potato for the job. For the best homemade hash browns, you want to choose the almighty russet (also known as the Idaho or baking potato). 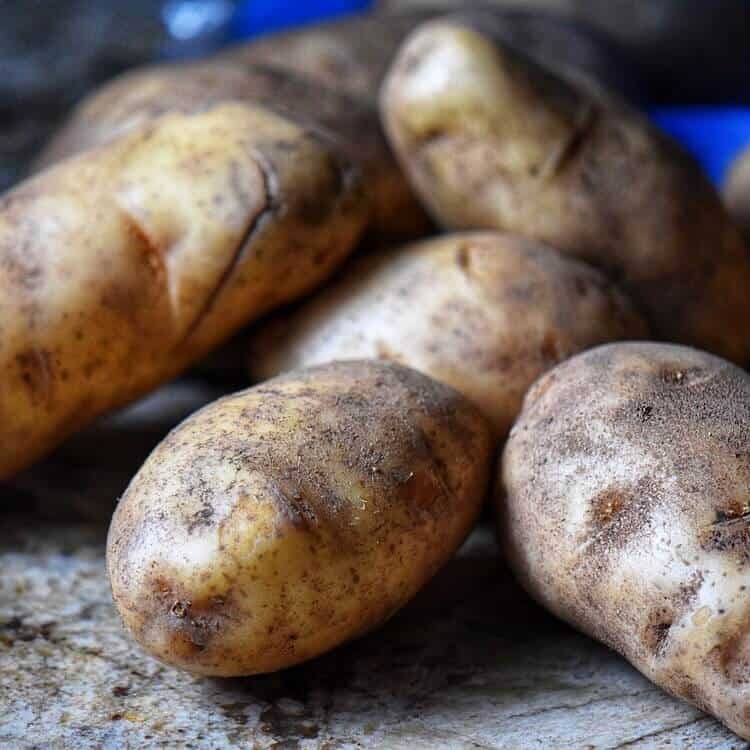 This oblong potato with the rough brown skin is the best potato for baking whole and for fluffy mashed potatoes -all because it has a firm flesh and maintains its structure when cooked. It is also the number one choice to make the perfect hash browns. This is the spud for us today. 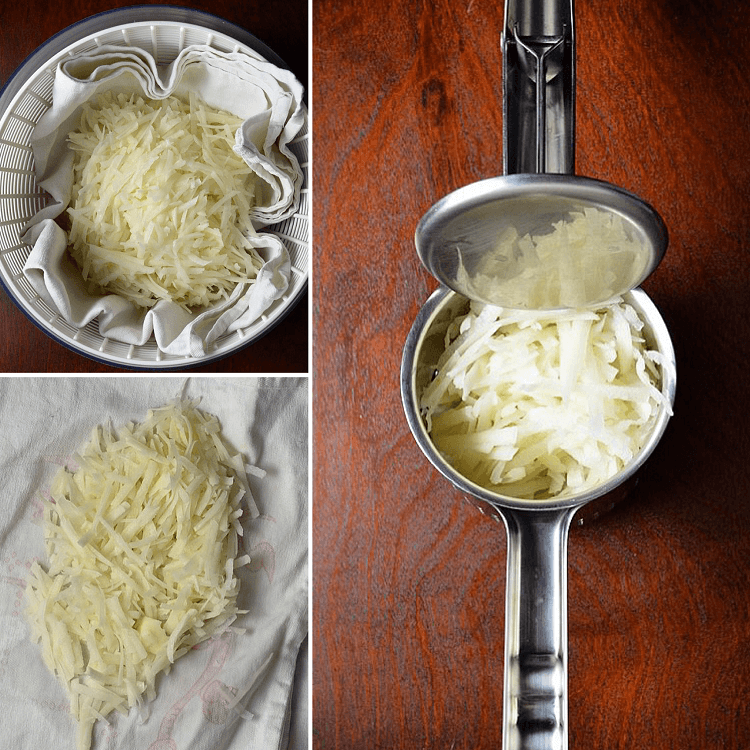 Homemade shredded hash brown potatoes can easily be made with a simple box grater. If making a large quantity, a food processor can also be used. Once you have peeled your potatoes, grate them with the coarse side of your box grater. It is very important to use the big, large holes of your grater. What does soaking potatoes in water do? Once you have grated your potatoes, soak them in a large bowl of cold water. The first thing you will notice is that the water immediately becomes cloudy. Swirl the grated potatoes around the bowl and strain. Repeat this at least 3 times, or until the water runs clear. What you are doing here is rinsing away the excess starch. Eliminating the excess starch will ensure hash brown potatoes which are not gummy in texture, in other words, your hash browns will get crispy when being pan fried. Why remove the moisture from the potatoes? Another contributing factor to obtain golden, crispy hash browns is using shredded potatoes which are as dry as possible. At this point you might be asking why did we soak them if we needed dry potatoes? Well, the soaking got rid of the starch which is one contributing factor to getting crisp hash browns; the other is getting the them as dry as possible. Option 1: a salad spinner. Place a clean tea towel on the inside of the salad spinner, followed by the shredded potato and spin away. Option 2: a potato ricer. You must work in batches for this option. Place about a cup or so of shredded potato and give it a gently squeeze. We just want to get rid of the extra moisture, we do not want to force them through the ricer. Option 3: a clean tea towel. If neither of these 2 options are available to you, use a clean cloth and squeeze out as much liquid as possible. If you recall, we used the same principle when we made these tasty Zucchini Fritters. How to make hash browns stick together? Once you’ve added your favorite seasonings (everything EXCEPT the salt) to your very dry, coarsely shredded potatoes, it’s time to turn on the heat. 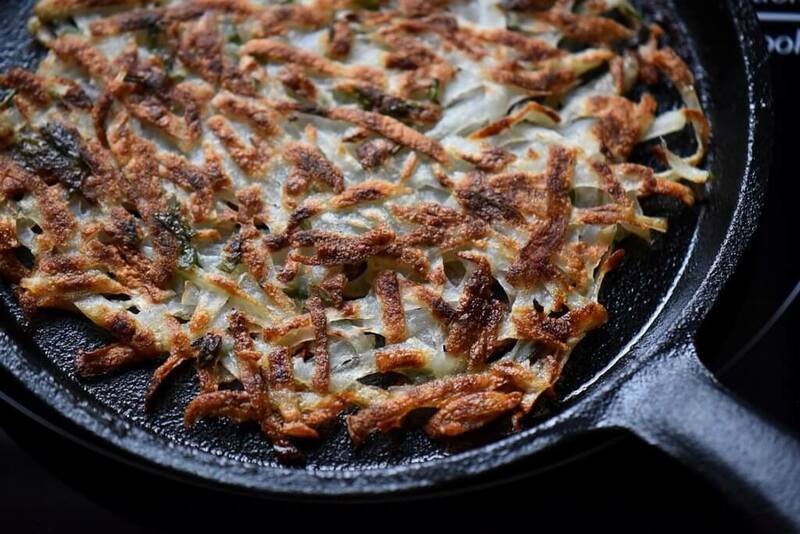 A cast iron pan is great to make hash brown potatoes. If you don’t have one, a non-stick pan works just as well. Make sure your pan is nice and hot and the butter is sizzling in order to get that crispy exterior. In fact, we will be adding equal amounts of butter and olive oil. Make sure there is a thin layer of oil covering the bottom of the whole pan as this will prevent the potatoes from sticking to the pan. It’s time to add your potatoes to the pan; spread your potatoes out evenly and gently press with a flat spatula -ideally they should be anywhere between 1/4-1/2 inch thick. Reduce the heat to medium and walk away. They need to cook for about 10 minutes. 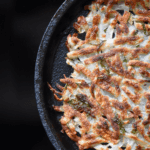 This will give your hash browns enough time for the bottom to become golden-brown. You have now attained 50% of the perfect hash brown potatoes: crispy on the outside. Just before you flip you Perfect Hash Brown Potatoes, you need to season them with salt. As you know, salt has the super ability to draw out moisture. If we were to add the salt any earlier, you would get a super-soggy hash brown. How to flip hash browns? I usually use a plate to help me flip this giant hash brown. Slide the hash brown potato onto a large plate. Place a second plate over the hash brown and turn the plates upside-down. The cooked side should be facing up. 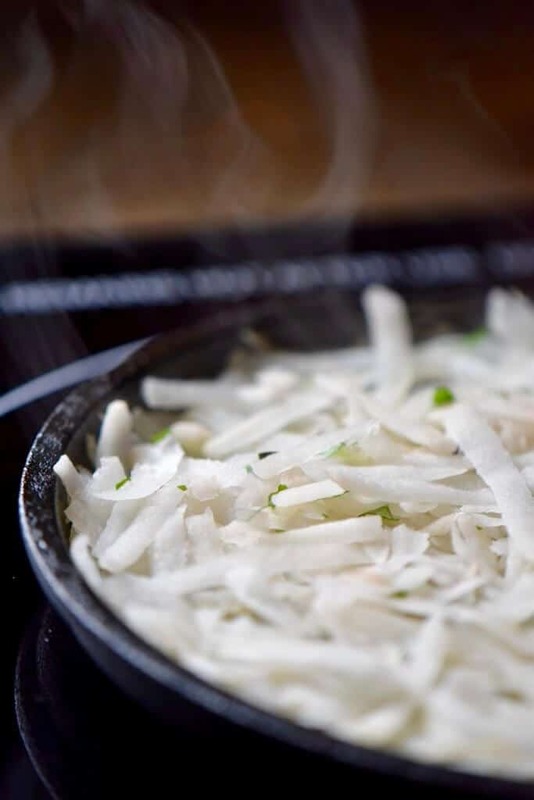 Place another tablespoon of oil and butter to the pan and slide the hash brown potato back. Once again, let it cook without touching it. Set the timer for about 8 minutes. You have just attained the other 50% of perfection: a tender interior. There you have it! The perfect hash brown potatoes. Remove from heat, and garnish with your favorite toppings. Ketchup, sautéed mushrooms and/or onions or even a poached egg are all great options. They are just as tasty garnished with fresh herbs, which can also be added to the shredded potatoes. Parsley, rosemary, thyme, chives are all fantastic options, fresh or dried. You can make individual hash browns, which can easily be frozen, or one large one that can be cut in quarters. A couple of years ago, I purchased a magazine from Better Homes and Gardens called “Cook’s Secrets”. There truly are some wonderful recipes in this publication, including this one. I’ve shared all of the secrets I know to making the Perfect Hash Brown Potatoes. Do you know any other hash brown secrets? This week end, treat yourself and your family. Skip the the commercial wannabe perfect hash brown potatoes, and say hello to your perfect homemade version! ★★★★★ If you have made this recipe Hash Brown Potatoes, I would love to hear about it in the comments below and be sure to rate the recipe! Hash brown potatoes should be crispy on the outside and tender on the inside. You won’t believe how simple it is to make the perfect homemade hash browns. 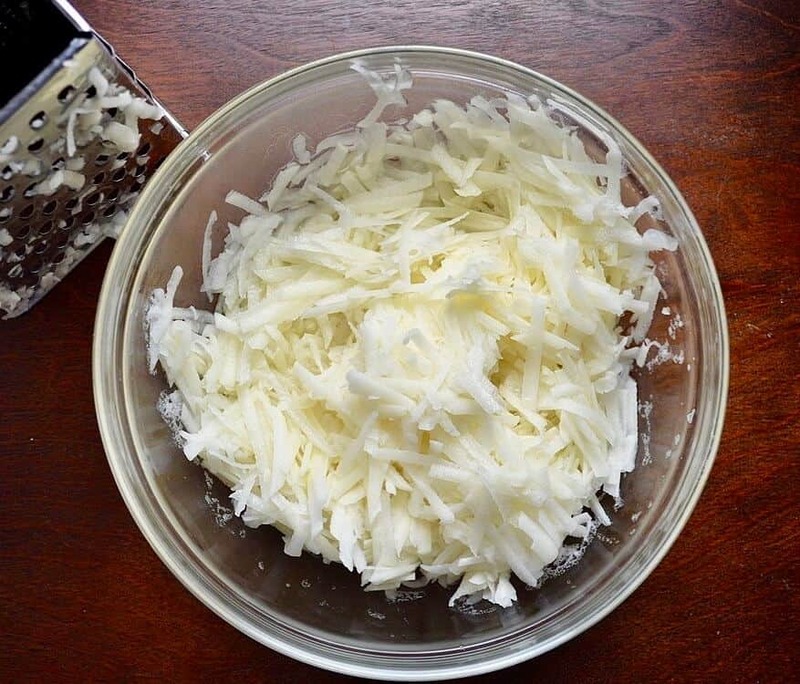 Using a box grater (or food processor) shred potatoes using the coarse side (or coarse shredder attachment). 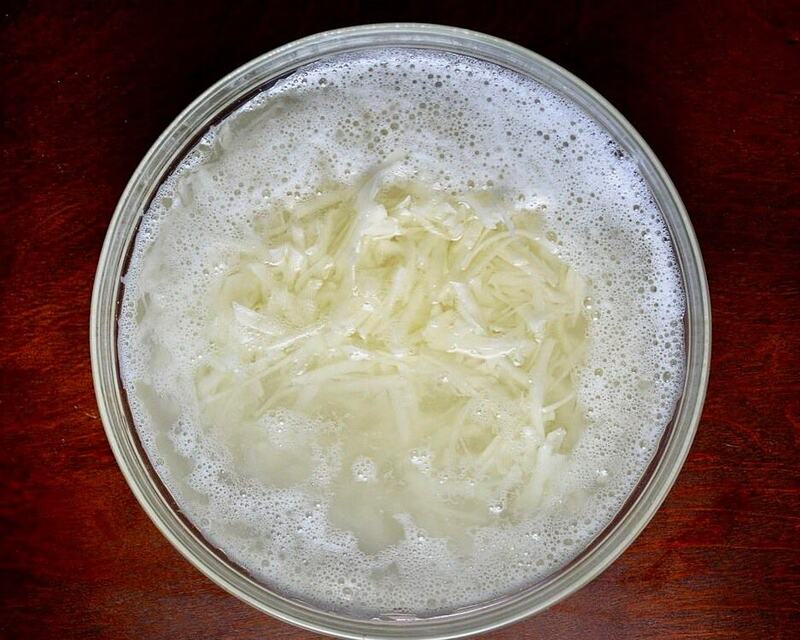 Place the shredded potatoes in a large bowl of cold water. Repeat three times or until water runs clear. With the use of a salad spinner, lined with a clean tea towel, spin until the potatoes are dry. Alternately, place shredded potaotes in a clean tea towel and squeeze or use a potato ricer to draw out the moisture. Place "dry" potatoes in a large bowl. Add your favourite seasonings (if using). Over medium-high heat, heat 1 tablespoon oil and butter in a 10-12-inch cast iron or nonstick frying pan. Make sure to cover entire pan. Once butter begins to sizzle, add the potatoes. With the help of a spatula, press down and flatten into an even layer (1/4-1/2 inch). Lower heat to medium, and cook, without stirring, for about 10 - 12 minutes. Just before flipping, add salt. Flip, with the help of a plate. Add remaining tablespoon of oil and butter. Slide hash brown back into pan and continue to cook for another 8 minutes. Use coconut oil instead of butter. Then recipe will work for vegans. Made them this morning, they were great! Thanks for sharing this hash browns recipe. They aren’t only for breakfast, anytime of day in my humble opinion. Your directions are spot on, details which are essential.